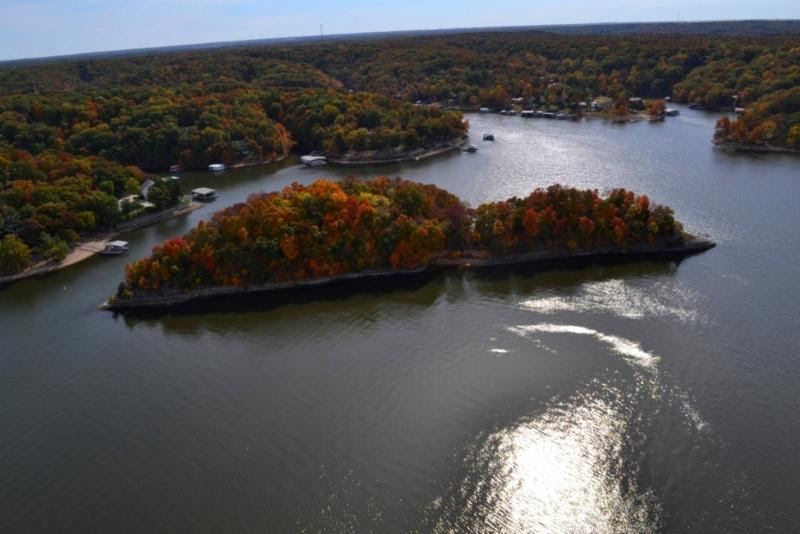 Summer may just be a memory, but for many people the cooler weather and brilliant colors at the lakes and rivers in the fall are the perfect time to enjoy boating. With crisp, cool air, beautiful fall colors and fewer people on the water, autumn might be the best time of year to go boating. However, shorter days and cold water can make for dangerous situations. Whether you’re simply taking leisurely trips around the lake, skiing or fishing, autumn is the perfect time to enjoy a longer season on the water as long as you take the proper precautions for cooler temps and shorter days to ensure your safety while boating. Make sure your boat is in good operational shape before going out. Always make sure you also have a couple of waterproof flashlights on board, along with extra batteries, to help guide your way if you happen to be docking after dark. With the loss of sunlight coming much quicker these days, you need to ensure you have working navigation lights. Wearing a life jacket is more important than ever. We all know if you’re boating you should wear a life jacket, but it’s even more crucial once summer is over and temperatures drop. Should you fall into the water, its coolness increases your chances of hypothermia and the later into the evening you’re out, the colder it will be. A life jacket will help protect you from the initial shock of the cold water if you go in. 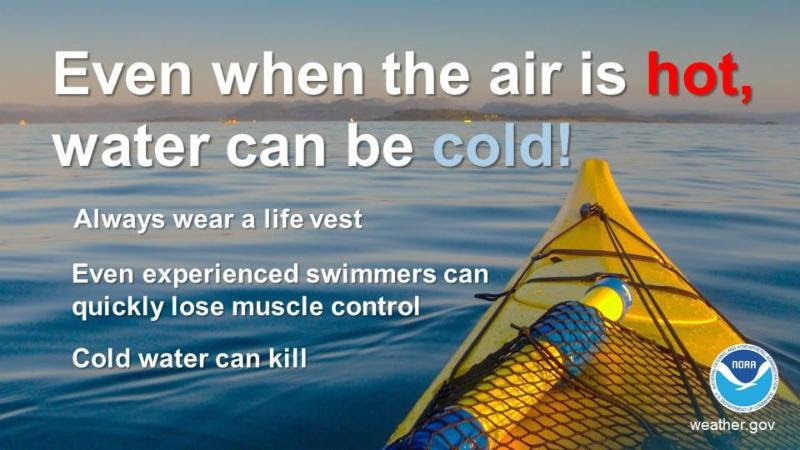 The fact is, with current water temperatures now in the 60’s, should you end up in the water you can find yourself in serious trouble with hypothermia. It’s always a good idea to have life jackets that have lights attached to them (it’s easier to be found if you do fall in) and a proper fit is important. Make sure you have a working cell phone and charger. With fewer people on the lakes this time of year, that means you have fewer options available if you need help. You should also consider having a working VHF radio. While being out on the water in the fall likely means you’re going to have more peace and quiet, you might also find yourself having issues with the boat, people on board, etc. and there might not be anyone else around. The radio is important in that it can help get help to you, even when your cell phone has no signal. This is no time to skimp on fuel. Fewer boaters mean that many marinas and fuel stops are cutting back their operation hours and may not be open, so always have plenty of fuel before you venture out so you’ll have no problems getting back. Take emergency supplies with you, just in case. Pack a small bag with a first aid kit, warm clothes, snacks, water, blanket and a tarp. 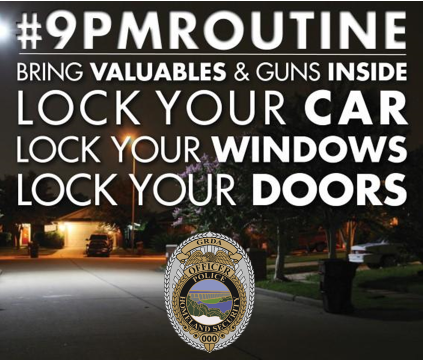 You can also keep your cell phone and other valuables in the bag for safekeeping. Check the weather before you leave. Remember that we are in the second storm season in Oklahoma, and the constant barrage of cold fronts almost daily means the weather can change from good to bad in no time. While the weather might be fine when you head out, an hour or two later it could be completely different. Before getting out on the water, check to see what the latest weather forecast is (there are plenty of great weather apps) so you don’t get caught in bad weather. Take foul weather gear with you for those “just in case” moments. Fog, mist and the sun going down can make it harder to see in the fall, so wear bright colors like orange, yellow or lime green. Also helpful would be having a strobe light or bright safety lights on your boat. Fall days can bring significant fluctuations in temperature and conditions. Dress appropriately in layers so you can adapt if it gets warmer or cooler. Also bring rain gear and a change of clothes. Have a Float Plan. Let someone know where you’ll be and when you expect to be back. 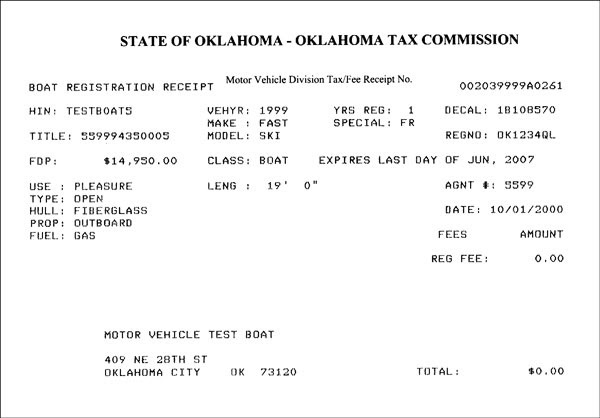 Make sure they know the description of your boat, phone number, and if you are launching from a ramp, they need to know the description of your vehicle and trailer so they can provide these details to authorities, if needed. At this time of year, if you do get in trouble on the water, time is of the essence. As water temperatures get colder, you should always go out with a friend. Use your engine kill switch. The colder water temperatures increase your risk of hypothermia in much less time, and the lack of other boaters will only increase the amount of time for a potential rescue should you be ejected or fall from your boat. The best protection is to use your engine kill switch so your boat does not run away from you (or over you) should you go over the side. Following these simple tips will assure your trips out on the water this fall will be enjoyable and safe! 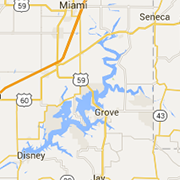 If you find yourself in the position of needing help on the lakes, call GRDA Police at 911. In order to facilitate a load testing project across Pensacola Dam, the Grand River Dam Authority is reporting that special traffic control signage will be in place across the dam, on selected days in early November. Drivers traveling Highway 28 across the dam on Tuesday, November 6 and Tuesday, November 13 should be aware of special signage and traffic control personnel. Weather permitting, the testing is anticipated to begin at 8:30 am and conclude at 11:30 am on each of those dates. However, a full closure of the roadway will not be necessary. GRDA asks for the public’s cooperation during this project, so that it can be completed both safely and promptly. The beauty of changing leaves can provide an ideal backdrop for a fall paddle down a scenic stream or to observe the wildlife on the lakes, but things can turn ugly if you don't wear a life jacket. 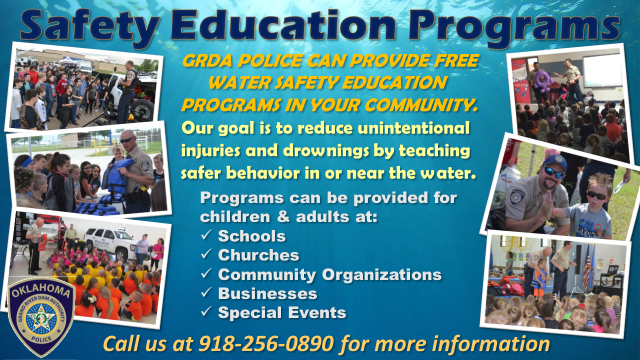 The GRDA Police reminds boaters that they are required to wear a life jacket while on any canoe or kayak. You are also required to remain within 150 feet of the shore unless in a cove protected by a No Wake zone. No boating trip should ever begin without wearing a life jacket, especially this time of year. Even on sunny days when air temperatures are comfortable, water temperatures are quickly dropping. Boaters, especially those in kayaks and canoes, are at greater risk for sudden cold water immersion. A life jacket can keep you afloat and alive. According to national boating accident reports, nearly 80-percent of all boating fatalities occur because of boaters not wearing life jackets. Left to right above, GRDA Officers Steven Treat and Derrick Bidleman are briefed by Mayes County Sheriff Mike Reed about the details on the search for a missing man last week. Officer Bidleman (right) accompanies GRDA helicopter pilot Brian Lambert in the search near Murphy in southern Mayes County. GRDA Police were called to assist with the search for a missing and endangered elderly man last week in southern Mayes County near Murphy. The secluded rural search area included hilly terrain, farmland and rivers, so GRDA officers employed a number of tools to assist with the search. The fact that GRDA has a vast array of equipment at our disposal including aircraft and boats means that we are regularly called upon to assist other emergency response agencies in the state. Officers used vehicles, rescue boats and a helicopter for the search last week. The GRDA courtesy dock at Eco will be closed for use through November. Access to the area has been closed with fencing and barricades (above). Work continues to progress on the shoreline stabilization project near the Ecosystems and Education Center. The Grand River Dam Authority is working on the shoreline near the courtesy dock located on Grand Lake, just behind the center in Langley, which is closed temporarily. Because of the presence of heavy equipment in the area, it is necessary to close the dock and the access path to allow the work to proceed safely. GRDA anticipates the project will be completed in late November. Do you have a Special Event Planned? All PFD's must be in good condition, immediately available to all occupants (not stowed away) and must be of the proper size for the intended wearer. Did you not receive our latest GRDA Update? Do you have a friend that wants to see our Updates? You can now go to our website at GRDA.com to view the latest edition of GRDA Police Updates. Go to the Lakes/River tab, open the GRDA Police tab and click on the GRDA Police Update for the latest version of our email release. When winterizing your boat don’t neglect your batteries. If the boat is to be hauled and put in dry storage for the winter, remove the battery, clean the exterior and store it where you can periodically charge it. The cable terminals should be wiped with petroleum jelly or other nonmetallic grease to prevent corrosion. If the boat is to remain in the water, it is best to leave the battery in place to provide electrical power for all 12 volt systems such as the bilge pumps and alarms. Be sure the battery stays charged through the winter as a discharged battery can freeze, expand and explode spraying acid in the surrounding area. It is also important to not overcharge a battery in cold weather as it can damage a battery and shorten its life. Interested in becoming more confident in your boating skills? Boat Smart from the start and take a course from America’s Boating Club, the United States Power Squadrons. 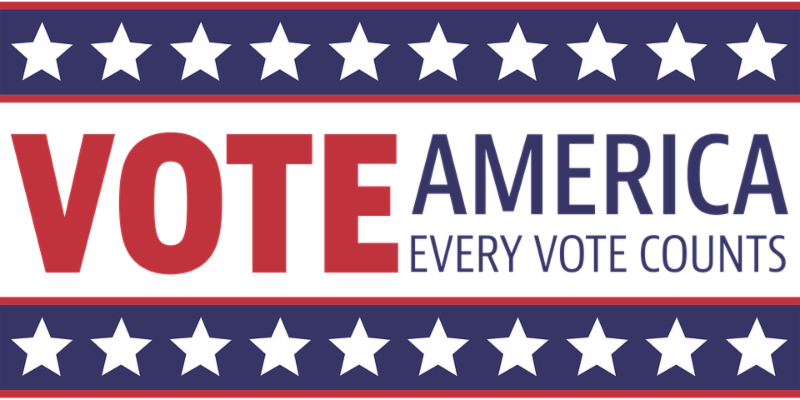 For local information visit our website at: usps.org/grandlake or on Face Book at GLSPS. The Certificate of Registration must be on board and available for inspection by an enforcement officer at all times. The registration number and validation decals must be displayed as follows. Number must be painted, applied as a decal, or otherwise affixed to both sides of the bow as high above the water line as possible. Number must read from left to right on both sides of the bow. Number must be in BLOCK characters that are at least three-inches high and one-half inch in stroke width. Number’s color must contrast sharply with its background. Letters must be separated from the numbers by a space or hyphen: OK 3717 ZW or OK-3717-ZW. No other numbers may be displayed on either side of the bow. Decals must be affixed on both sides of the bow, behind (towards the stern) and in line with the number. There is no better way to support our troops than through the local chapter of the Blue Star Moms. In an effort to provide a few creature comforts and a reminder of "home" to our troops from Mayes, Delaware and Craig counties deployed outside the United States, our local Blue Star Moms chapter sends care packages to our troops on a regular basis. But this can be a costly expense, considering the postage for one package alone is $18.00, not including the cost of the contents. 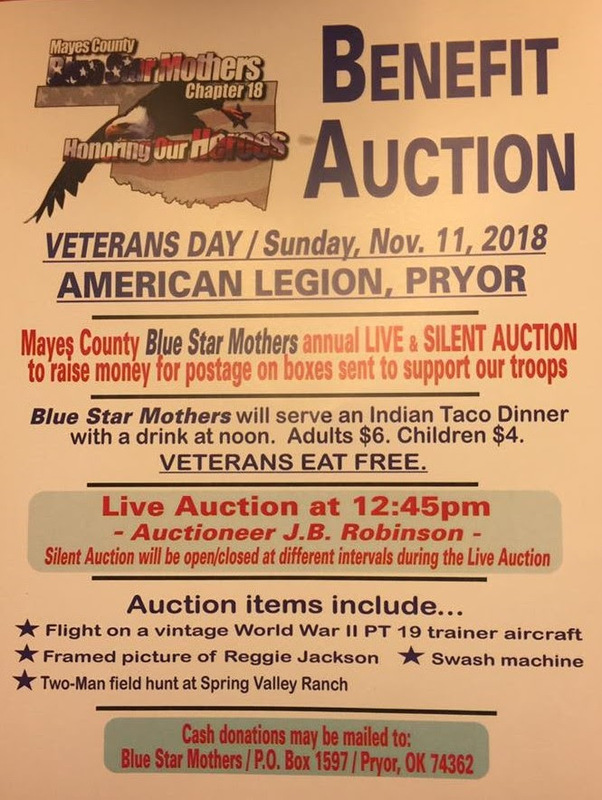 In order to keep this important cause moving forward, the local chapter of the Blue Star Moms will be holding a fundraiser that includes a live and silent auction on Sunday, November 11th at 12 PM located at the Pryor American Legion, 1105 W. Graham Avenue in Pryor. An Indian Taco Dinner will be served for only $6 for adults and $4 for children, with the auction beginning at 12:45. In order to cover the expense of mailing at least 50 care-packages per month, the Blue Star Moms are looking for businesses and organizations that are willing to donate items or gift certificates that can be included in the auctions. If you are interested in supporting our troops through a donation, please call Pam Buffington at 918-645-5489. Cash donations can be mailed to Blue Star Mothers, PO Box 1597, Pryor, Ok 74362.